Enjoy your favorite draught beers at home with this Personalized Black Stainless Steel Beer Growler and glasses set. 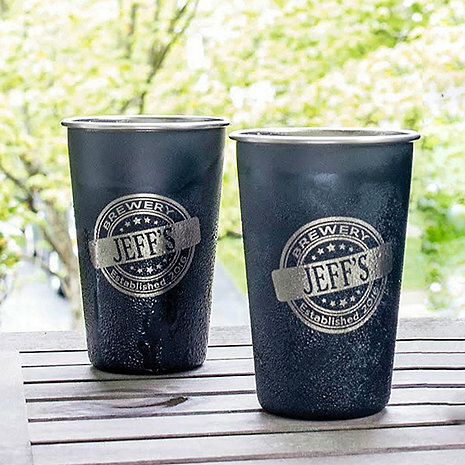 Each black matte piece is laser etched with a personalized brewery logo with the name and year of choice. The wire-flip lid creates a seal, keeping beer fresher for longer, while the built-in carrying handle makes transporting filled growlers a snap. Decorated in the USA. Stainless Glasses Capacity: 18 fl oz. Great gift idea or for your own bar. Great gift idea. My buddies were all very impressed.